This cabin will accommodate six persons. One bedroom has a queen-size bed, one bedroom has a double bed, and one bedroom has two twin beds. Unique to this cabin is its location, located only 15 feet from the shoreline, on its own peninsula. Beautiful view, relaxing sounds, privacy. One of the original log buildings at our Resort, yet still very popular, this modernized spacious cabin will accommodate 6 persons. One bedroom has a queen-size bed, one bedroom has a double bed and one bedroom has a set of twin beds. 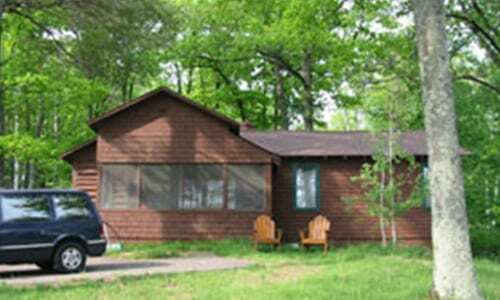 This cabin also has an open view wood burning stove and a screened-in porch.